"More than ever, leaders are expected to be the change agents of their organizations. Yet CEO turnover continues to rise and organizations continue to struggle in their efforts to confront the fearsome adaptive challenges of the global age. 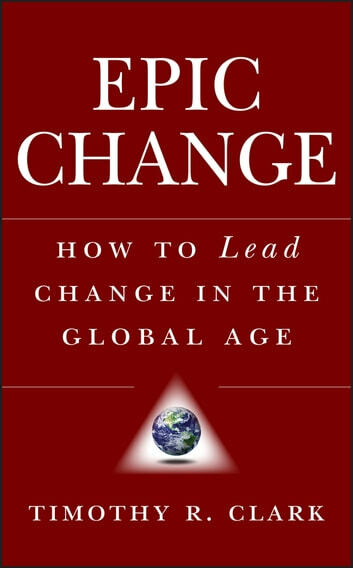 Epic Change is a path-breaking contribution to the study of leadership and organizational change. 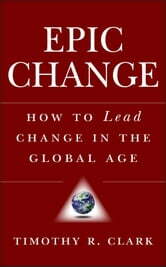 Based on a landmark study of 53 cases of large-scale organizational change in business, healthcare, government, education, and the non-profit sector, acclaimed thought leader and researcher, Dr. Timothy R. Clark unveils the "Power Curve of Change" framework and EPIC system for change management (Evaluate, Prepare, Implement, Consolidate) for leaders who are charged to lead high-stakes change initiatives in their organizations. Epic Change presents a strategic-level road map, along with tactical level tools, for the every-day needs of leaders who must respond to all types of adaptive challenge to remain competitive. It represents a comprehensive, research-based program for leaders who want to develop the indispensable competency of leading change in a permanently and profoundly different age. Change rarely fails for lack of strategy—Clark shows that only the discretionary efforts of people can make change happen—and this requires leadership and energy management. The Epic Change approach has been successfully field-tested with leaders at all levels and in organizations around the world. This important resource provides leaders new research-based tools to increase and sustain the energy of any change effort."